Jigsaw activities are not a new innovation in education. Teachers have been using the strategy for years because it blends independent work with the power of group work to extend learning. John Hattie even found that it was one of the only activities in his model that helped students acquire and consolidate both surface and deep knowledge. Kyle Halle-Erby, a 12th grade English teacher at San Francisco International High School likes the jigsaw activity because it helps his English language learning students feel comfortable participating in literature discussions. He'll often do a jigsaw activity before a literature discussion to help students playing different facilitating roles prepare together before joining a group where they will be the only person with that role. "Our classrooms are always heterogeneous and we foster as much collaboration as possible," Halle-Erby said in a Teaching Channel video about his strategies. "The idea is that students will develop their English skills most effectively if they're participating in complex tasks as a group where the common language is English." His class is focused on developing specific skills around textual analysis and discussion that students will need in college. "I think that discussion makes reading and reading comprehension visible in a way that otherwise it can feel very invisible. And so asking students to produce language about what they've read is a really important evaluation and assessment tool that I use," Halle-Erby said. He has students record their conversations on their phones so he can listen later for the type of language he's been encouraging all year. 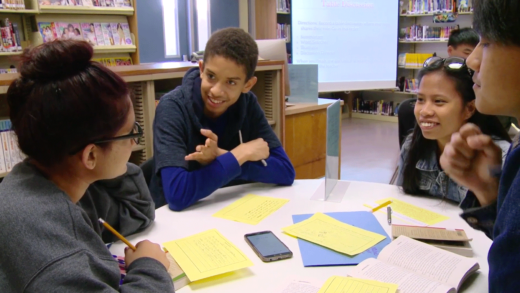 Literature Circles: Fostering Heterogenous Collaboration from Teaching Channel on Vimeo.